Yeah, that sky made a beautiful backdrop to the buck. I don't mind the fg stuff but wish for more room for his feet. Beautiful last light pastel glow in the sky. 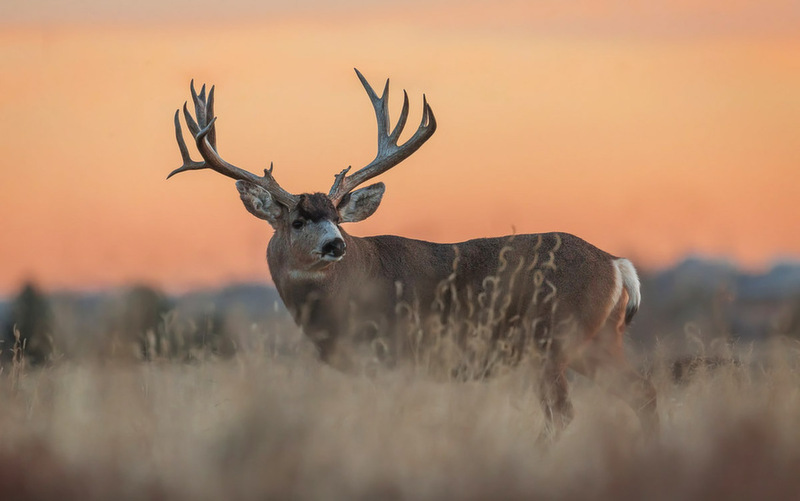 Very pretty sunset for a nice, handsome buck. Great looking buck. The sky is wonderful and I like the low angle. FG stuff doesn't bother me. I might have opened up the shadows on the buck a couple of notches, but not too much. Good as is, but a bit more detail on the animal would be nice. That colorful sky makes such a wonderful background. Nice pose with the buck looking back and showing his rack to best advantage. I don't mind the foreground stuff because the head is totally clear of it, might be a different story if the face was obscured. I wish you had not gone so low to allow the FG grasses to be less conspicuous. Agree with a bit more room on the bottom of the frame. Shooting from a higher angle completely changed the mood of the image. I know I have that image also. A slightly higher put a horizon right through the head. The deers feet would be completely within the frame if they were visible. Nice pose and fantastic background.